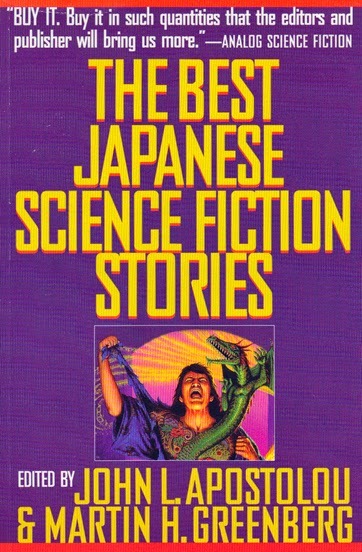 This anthology of Japanese science fiction was first published in 1988 and is comprised of stories dating back to the 60’s, so in terms of my interest in comparing SF from other cultures, it doesn’t really give me an idea of what contemporary Japanese SF is like. What I did find interesting is that, similar to Anglophone SF of the same period, the protagonists are all male, and female characters play little, if any, active roles in the stories. I can only assume that this has changed with time as it has done to some degree in English SF. Many of the stories are set in contemporary or near-future Japan, and even where aspects of society are obviously futuristic, the settings themselves are not startlingly different from today. I found several of the stories to be rather, I don’t know, naïve? They told stories of things that were intended to be amazing, but were not at all surprising. Again, I’m assuming this is due to the age of the stories, and to the fact that I’m very well read in SF. One thing that stood out is that the stories are often narrated in the style of a parable rather than from an individual point of view. Another thing that particularly struck me is that none of the protagonists have names. They are always referred to as ‘the young man’, ‘the father’, ‘the boy’ etc. In fact the only characters who are named are the non-humans. Again, I wonder if this is typical of Japanese fiction, or just of that time period? Two stories: ‘The Road to the Sea’ and ‘Fnifmum’ stood out among the collection, the kind of tales that leave you feeling satisfied at have read them. Then I came to the final entry, ‘The Legend of the Paper Spaceship’, a novelette by Tetsu Yano, described as ‘the dean of Japanese SF writers’. For this story, ignore everything else I have written. This is a classic in any time and place.